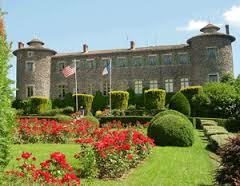 Who knew that Lafayette was born in the Chateau Chavaniac in Massif Central section of France? Apparently John and I had done our homework, for were in the know! We took a special out-of-the-way detour to find his birthplace. We were in the middle of a marvelous 2 week auto tour of some of our favorite places in France that year. Although I had traveled extensively in France over the span of decades, Lafayette’s homeland had never been on my route. It is is an area of France, not generally traveled by the casual tourist. It is many hours from Paris and is in the central, southern section of the country. It is mountainous and had been virtually inaccessible for centuries before the advent of a national north-south route. John and I were on a quest to find Lafayette’s birthplace. I love being on a quest. I have followed many such quests on each of my visits to France and they have all come to fruition. This one was no exception. As a member of the CT Governor’s Advisory Commission on Cultural and Francophone Affairs in my state, I made a preliminary call to the Chateau de Chavaniac before we left home inquiring if the home would be open in May that year. The answer was “Non, Madame, nous sommes en train de moderniser le chateau.” Then the lovely lady in charge added that if we did not mind the confusion of workers in every room, she would give John and me a private tour. I was thrilled! When we arrived we found that the workers were busy in all 100 rooms simultaneously bringing the entire chateau up to museum standards. Most of the funds, as I understood, were donated by Americans who value the work Lafayette did to help the birthing of our nation. For me, the most exciting room was Lafayette’s nursery. It was a small, but beautifully appointed bedchamber for the baby Lafayette. We admired the toile patterned fabric, that adorned the room. It was the original toile with detailed ships and landscapes in a ruddy red on an ivory background. There was a baldaquin (canopy) over the baby’s cradle in the same fabric. I fell in love with the decor. We were allowed to videotape the entire tour, so I had the description of the room and tape of the colors and designs. 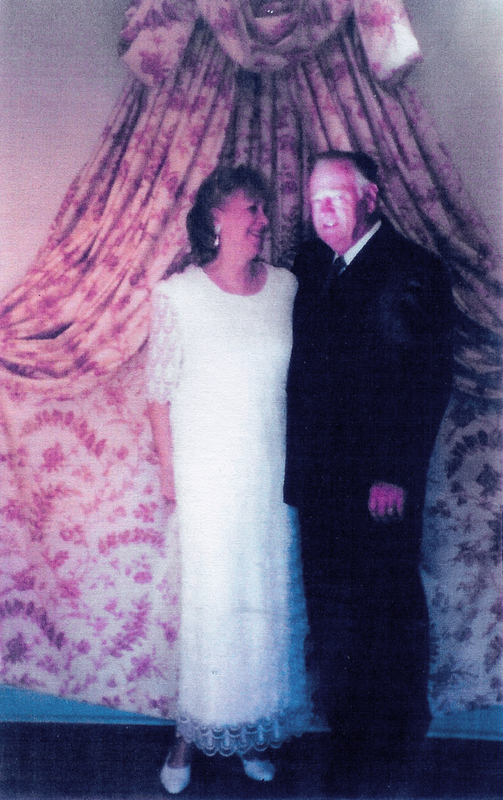 When we returned home, we began a large redecorating job of our own in the master bedroom and guest room. I designed the interior of the master bedroom to mirror that of Lafayette’s natal bedchamber. I found the fabric that closely matched the original in France. John built the decorative wooden form that was to hold the baldaquin. We gave the seamstress 75 yards of fabric with which to make the baldaquin, the drapery behind the bed, cover the three windows and to “dress” our king size bed with bedspread and multi pillows. Then we found a tapestry to hang on the wall and I put together framed prints of Lafayette, Rochambeau and George Washington. Last, but not least, my friend, Cat Styvel, who had been visiting, offered to paint extensive trompe l’oeil woodwork in a coordinating antique green on the four ivory walls. 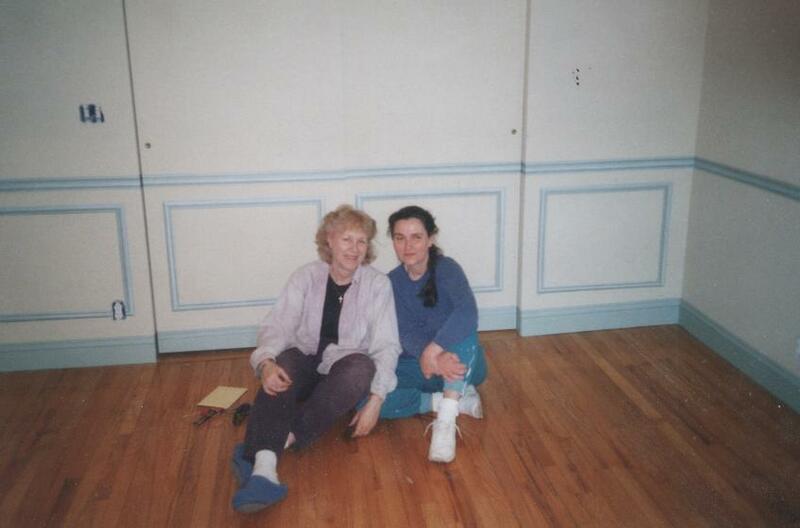 Here are Cat and myself in the Lafayette bedroom with her job completed – a week’s work! Then John had a brass plate made for the door: ‘The Lafayette Bedroom”. It was a coup de grace! Our visit to Chavaniac turned out to have lasting memories for us both in France and at home.